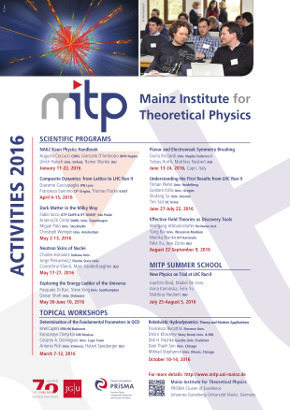 The application is open until July 1, 2016. Interest in Relativistic Hydrodynamics (RH) has experienced explosive growth recently, motivated by new applications to relativistic heavy-ion collisions as well as by surprising and deep connections to advanced topics in theoretical physics such as anomalies and gauge-gravity duality. A lot of new theoretical work with novel experimental applications has been done recently, beyond one of the traditional applications of RH - relativistic astrophysics. In view of the recent rapid development of RH, the topical workshop will review and summarize achievements, address open issues, and map out promising directions for future research. The topical workshop will bring together physicists working with RH in different contexts (from high-energy nuclear physics and astrophysics to mathematical physics), giving them time to share expertise and ideas, establishing a common language and kindling new collaborations.